We are frequently asked questions regarding the difference between educational therapy and tutoring. This is a hugely important topic for us. 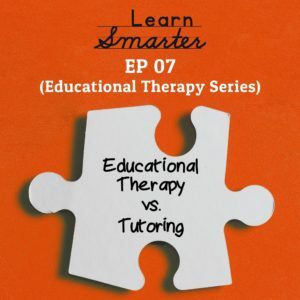 We are going to dig into the differences between the two, how the two can work in tandem, and how sometimes tutoring can work against the goals of educational therapy. This is the second post of our educational therapy series. Be sure to go back to blog 06 where we discuss dreaded homework for the first post in our educational therapy series. What is the difference between educational therapy and tutoring? We get asked this question all of the time. We are happy to clarify this mystery for you. We know there is confusion about this so we have broken the topic down into seven main points of comparison. Educational therapy is about strategy. It is about building a toolbox of strategies, how you approach learning, and the classroom environment. Educational therapy is much broader than tutoring. An ed therapist is a case manager for the whole team which includes the child, parent, teacher, tutors, psychiatrists, therapists, etc. An ed therapist is interested in supporting the whole child. Educational therapy is a long-term play. A common misconception is that ed therapy is just for students with a learning disability but that is not true. Students come to us for a variety of reasons–anywhere from test anxiety to a desire to learn how to be a more efficient student. On the other hand, when it comes to tutoring it is really all about tactics rather than strategy. Tutoring is short term. It is about content and classroom curriculum. Tutors teach specific subject matters. Usually, a tutor is not going to communicate with the teacher or be a case manager on behalf of the student or the family. Tutoring is a shorter term solution. While an educational therapist is an expert on learning, a tutor should be an expert in their subject area. There is a caveat to this in that there is a slight overlap between educational therapy and tutoring. Sometimes an educational therapist has to cover a content area in order to teach a strategy. Educational therapy definitely does support classroom learning and content areas but has a much wider, more global view on how strategies can get used over the long term. When considering the difference between educational therapy and tutoring just remember that tutoring is very focused and educational therapy is global. An educational therapist is highly trained usually with a masters degree in special education or learning. There are only a few master degree programs in the country and only a couple of them offer a certification in ed therapy. We met each other at the California State University of Northridge program which provides certification in educational therapy and Masters degrees in educational therapy and special education. Figuring out who is an educational therapist can be difficult because anyone can call themselves an educational therapist. As a field, we do not have licensure the way that speech and language pathologists or psychotherapists do. One way to tell if the professional that you are working with is an educational therapist is to check the Association of Educational Therapy website to see if they are listed as an educational therapist. The Association of Educational Therapists, or AET, has guidelines and course requirements that provide some oversight internally. There are people who are not members of AET but who have still met the qualifications to be an educational therapist. Ask whoever you are working with for more information if they are calling themselves an educational therapist. Although it can be a little tricky, generally, educational therapists are a member of AET and sanctioned to practice ed therapy by the association. As for tutors, they do not have to have formal training. They could be people who are gifted in a content area or simply may have taken the class your child is taking. Tutors may also be teachers within your local area. The main goal of an educational therapy is to no longer need educational therapy. We strive toward independence and autonomy in learning, school, and life for your student. Meanwhile, the goal for tutoring is to give support in a subject area. An educational therapist is constantly working themselves out of a job. We terminate a relationship with the child when we see that the child is completing work independently and that the student not only knows the strategies but is able to select which strategy to apply in a variety of different situations. This happens slowly but eventually, the student is seamlessly self-selecting how to approach a task and completing successfully without any intervention. We tend to “push kids out” of educational therapy. The goal is to no longer need us! For tutoring, on the other hand, it ends when the student gets over a hump in the class or at the end of a school year. The student is now understanding the concept or whatever it is they were struggling in that class. Tutoring can end for the summer but educational therapy does not. Educational therapy can continue after the school year ends or during school breaks. The reason we work with students year round is because it is a RELIEF to work on skills and strategies without the pressure of school simultaneously. We don’t want to lose momentum and it is a great way to preview the following school year and/or what is coming up in the near future. In educational therapy, growth is measured by psychoeducational goals that are achieved. As an example, let’s say we have a student, named Sarah, who struggles in math. A goal for this student that we might give is, “Sarah will benefit by increasing her ability to automate her math facts through songs, skip counting, and long-term rehearsal.” We know Sarah has achieved this goal once she can successfully skip count her numbers and be able to fluidly recall math facts on demand using her strategies. It’s not just about grades. It’s about a students growth in an area of previous struggle. Their accomplishments go from being dependent on outside support to being able to tackle a similar task at a later date without the support. Using an analogy of a bike, when you first begin learning to ride a bike you have training wheels. Once you have mastered how to ride the bike you take the training wheels off. Our goal is to get our students to ride two-wheelers. The measurement for tutoring is truly just grades. Ed therapy and tutoring can actually work in tandem with each other with the educational therapist being the leader of the team and the tutor supporting learning by using the strategies that the educational therapist is providing to the student. This is when tutoring is very helpful. It is supporting the mission of independence and autonomy. Whether or not we would make the recommendation for tutoring partially depends on how far behind the student is. We are very careful about tutoring because it has the potential of becoming the reason that students learn how to be a little helpless. In tutoring, learned helplessness can arise in a variety of ways. One way is that the child learns to lean on someone else to do something for them because either they just don’t want to do it or because it is too hard. In the case of the student who struggles in math, for example, learned helplessness is when he/she waits for the tutor to come to start an assignment or goes back to school the next day with question marks on all of the problems without even trying to do it on their own. Do you want to be paying for tutoring when your child is in college? We want to be clear that we are not anti-tutoring at all. We just advocate for a mindful approach to tutoring. Overall, educational therapy covers academic, non-academic, and socioemotional parts of learning. This includes organization, problem-solving, attention, self-esteem, metacognition, self-advocacy, and motivation. It also addresses the emotions and the behaviors surrounding learning. Tutoring is much more appropriate when your child does not understand a specific concept or subject area. Your child likely has strategies in place for how to find the answers but still is not quite able to put the pieces together on their own. We both frequently make the recommendation for tutors because we see its benefit! It is something that works in tandem with what we do. It certainly does not run the whole gamut of what educational therapy offers. If you have a question about what is right for your child feel free to connect with us on Facebook in our Smarties of the Learn Smarter Podcast group or e-mail us. You could always book a strategy session which you can do by clicking the “Work with Us” link on our website. 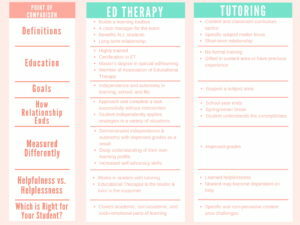 So…what IS the difference between educational therapy and tutoring? This is definitely one of the most common questions Rachel & Steph are asked. In this episode, Rachel & Steph discuss the major differences between an educational therapist and a tutor. Topics discussed include: definition, educational background, goals, monitoring of progress, helpfulness vs. helplessness, and HOW to determine if your child needs an ed therapist or a tutor.